While pondering what I wanted for my birthday this year, I realized that as I enter the second half of my fiftieth decade, (WHHAATT!) I don’t want one singular gift…I want 365 gifts! Gifts of all kinds, from all aspects of my life. Spiritual, intellectual, emotional, quiet and surprising gifts that bypass my hands and travel straight to my heart. Pretty, material gifts, both major and mini, that delight my senses. And alas, but most importantly…guilt free gifts. I love buying gifts for others. I love receiving gifts. Yet when it comes to giving the most invaluable gift of all, that of giving to myself, I’ve often fallen short of steering free from the no guilt zone. I wonder – Is guilt activated the moment we leave our mother’s womb? Is it a genetic predisposition passed down to us as soon as we officially enter into the noble art of motherhood? Or is it simply part of what makes us a woman. IS it in our DNA – no matter our lineage? Are we born with guilt or do we learn it? Why is it we feel guilty giving to ourselves – why do we feel we must sometimes sacrifice so that others may enjoy? As if Robin Hood and his proverbial merry band of thieves have taken up camp from within, taunting us to rob from ourselves so that we may give to others. While us women are such efficient multi-taskers by nature, we often forget the most important task of all. Ourselves. Realizing of course, there is sacrifice annnd there is SACRIFICE: the easy breezy sacrifice that is second nature to motherhood, the one that feels like a warm spring afternoon spent watching flowers we planted, open and flourishing. Leaving us replenished, our souls fed, knowing our hard work paid off. And the other sacrifice, laden with the frosty, bitter chill of guilt that’s difficult to breath in. Numbing our heart. Leaving us depleted, cold, and in search of nourishment. As we watched our mothers sacrificing for the sake of others, it played in our minds like a subliminal message in a TV commercial. (you must sacrifice, you must sacrifice) Until before we knew it our conscious mind believed what our subconscious had been seeing day after day, year after year. Yes, we believed we too, needed to put everyone else’s needs before our own. And guilt flourished. I really hope this won’t be confused with my true feelings on motherhood, inasmuch as I loved every singular aspect of being a mother to our two children, and I wouldn’t trade one precious moment of it. Not a one. Our son still visits me in dreams when my heart beckons. And today, I have the immense pleasure of being a friend and mother to our sweet adult daughter. That my friends, is no subliminal message! So much so, that I want to reflect back to my younger self and have a chat. My first gift. A sort of re-gifting if you will. I want to pay it forward to all the young ones still exploring their world, the ones about to drink the Kool-aid of the early years of marriage, and the ones entering into motherhood: in the hopes that they will be more generous to themselves. Pay attention to the world around you. In every absolute or nuisance there exists a message, an inspiration or a truth. Forgive yourself. If you’re genuinely living you’ve already messed up or soon will. Let it go. Free yourself of the heavy, burdensome baggage of the past. Let it teach you and graduate you on to the next phase of your life, all the wiser. Be ridiculous. Not for the sake of being ridiculous, but because what you’re doing is so silly, impossible or out of the norm – it just is. (Please continue throughout each decade.) If DOUBT is flashing like a neon traffic light on crack, cast your beautiful eyes upon it and like mama taught you long ago…Stop, Look and Listen – it’s flashing for a reason, my dear. You are your worst critic at times. Stop it! Replace with laughter. I promise you what your kids will remember the most is the time you spent together, and whether you’re crafting the most intricate Halloween costume or doing nothing but snuggling…it doesn’t matter. They’ll remember the smell of their favorite meal cooking and whether it took thirty minutes or three hours to prepare…it doesn’t matter. They’ll remember family traditions, and whether they’re grandiose or insanely simple…it doesn’t matter. They’ll remember the games, recitals, plays and spelling bees you attended, and whether they did well or not…it doesn’t matter. It doesn’t matter whether you’re a gourmet chef, a craft wizard or a decorating phenom…it just. doesn’t. matter. It matters that you showed up with your whole heart. Banish guilt. For good! Say to the notorious Mr. Guilt, “I’ve lived with you long enough and frankly, you bore me. The time we’ve spent together has been, how should I say, useless.” Mr. Guilt’s nasty stepsister – Ms. Judgment needs to be tossed in the trunk where she can’t be seen or heard, either. We’ve all judged and been judged, hopefully we’ve recognized its poison and discarded its toxic ingredients. And those who have judged you..it really doesn’t matter. People who love you unconditionally, simply won’t. Stand tall and occupy your space – it’s easy to get swallowed up in everybody else’s world. You’re not just a work in progress: you are a MASTERPIECE in the works. Give yourself major credit for getting this far, for having raised your children (or choosing not to have children) and overcoming whatever obstacles life threw recklessly in your path. Know that it’s never too late to hit the start over button. Celebrate this resplendent phase of your life! Drink the kool-aid, wine or beer, because you earned it dammit! Where there’s reflection there is light, where there’s light there is love. Mistakes do not exist, only chapter endings that send us on to our next beginning – hardening or softening our edges, as needed. We learn what we won’t stand for and what we can stand up against. Whatever the case, we move on with a more acute sense of ourself and our boundaries. We develop new insights: enabling us to see clearly through, to the once muddy layers of our soul. Stop and take a long curative breath. Breathe in the magnificent person that you are. Hold it. Smile inwardly to your heart. Now breathe out all that you are yet to become. An offering to the universe. See yourself expanding and evolving. Smile outwardly to your future self. And remember: your friends, boyfriend, spouse and children, all breathe the same air. So as I mark the first day of my 56th year: I will light a new candle, a gift I was saving for a special occasion. And I’ll remind myself not to save things for a special occasion. I’ll celebrate what I’ve overcome. I will be grateful for having been scared, realizing that this kind of scared is the best truth and beauty serum rolled into one splendiferous package, that a girl could ask for. Most importantly, I’ll celebrate what I’m doing…following my passion, finding the courage to face my fears, and writing like I’ve never written before. Happy Birthday to my younger, wiser, ridiculously philosophical, silly, imperfect, ever evolving self. (As Pharrell’s song, Happy, plays in my head!) Clap along if you feel like happiness is the truth. Spread the HAPPY, clap along…and make every day a special occasion! 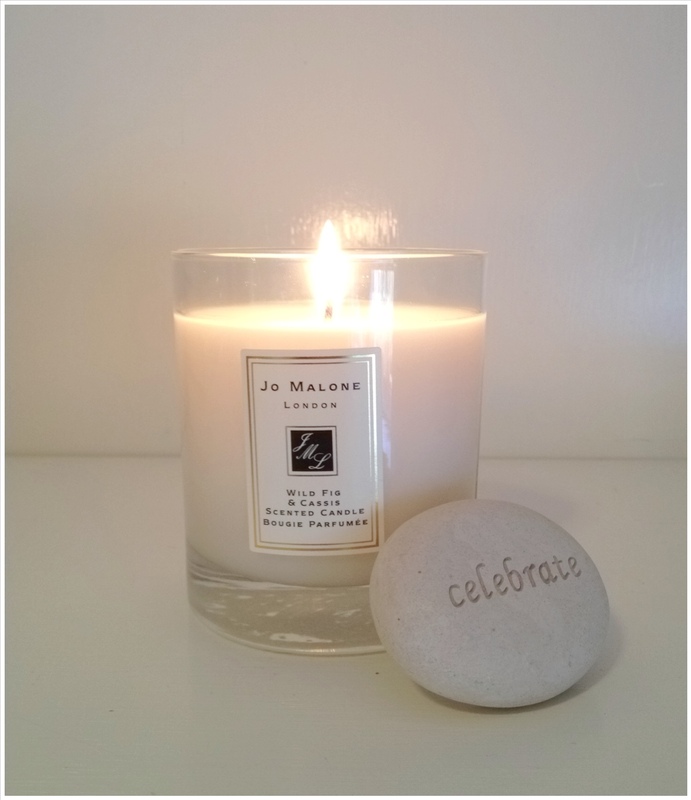 This entry was posted in Inspiration, The empty nest, Women and tagged birthday, candle, children, Corneille., courage, Empty nest, Gifts, guilt, happiness, Inspiration, Jo Malone, motherhood, passion, sacrifice, Women. Bookmark the permalink.